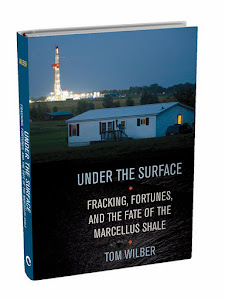 Shale Gas Review: Is the mainstream press anti-drilling, or just liberal? Is the mainstream press anti-drilling, or just liberal? I’m going to digress from the topic of shale gas to tell you a secret about the media that covers it: It is, in fact, liberal! This is the way it was done in 20 Century America, especially in the early decades when robber barons accumulated unprecedented and unhealthy concentrations of wealth. This type of liberalism was at the very nature of a reporter's calling. In the 21st century newsrooms, Fox News has shifted the journalistic paradigm to the right, to a place where capital and institutional forces – depending on their political shade – are handled in a certain way spun as “fair and balanced” and aggressive reporting is painted as a liberal bias. I find this quote relevant and interesting enough to include as a sidebar on this website. That may put me in the anti-drilling camp in the eyes of some. In fact, I am neither an anti-drilling activist, nor an industry booster. As a working journalist, I try to cut through the rhetoric that has come to define the polar reaches of the shale gas debate. It’s impossible to overlook the fact that Pulitzer himself was a tycoon who became a member of the privileged class by building a publishing empire based on mass circulation newspapers (and advertising) that lowered the barrier of entry to matters of political reform for the common man. Pulitzer, the populist, was also a self made man, and his ability to articulate and exercise the principals of the free press in a way that rang true is embodied in the mythos of the prize that is named after him. Without going too far afield, I think it’s worthwhile to offer this perspective from which to assess the daily coverage of drilling that has, in some instances, become as controversial as the drilling itself. I write this as a reminder to people who find it unfair that the media is always snooping around for problems related to drilling and often overlooking the “good news” which is routinely advertised by an industry that portrays itself as harnessing the clean, abundant energy of tomorrow for the good of everybody. Somebody has to tell the other side of the story. The industry has waged a public campaign against Ian Urbina, of the New York Times, for example, and other journalists raking the muck, and I have felt the criticism from some quarters discrediting my own coverage when it tended to dwell on problems rather than promotion of shale gas development. That is fine with me. Criticism that fosters debate, especially one of the magnitude and importance of the shale gas story, is healthy; and the press should not be excused from critical review and challenges of accountability from all sides. As a reader (or maybe I should characterize myself in this modern time as a consumer of news) I still expect news agencies to employ Pulitzer's standard of journalism. Turn loose the muckrakers to let in air and light to issues, and the watchdogs to hunt the scent of corporate maleficence. The resulting reports at the morning table may cause heart burn, but at least I feel like I’m getting a view that goes beyond – and perhaps even balances out -- the easily digestible, well-funded glossy campaigns.